Ed. Note: I'm happy to share this guest post from writer Tamara Williamson about a slice of Memphis history, the building at 409 South Main. The story of 409 South Main (a.k.a. the Puck Building) is, in a way, the story of downtown Memphis. From a grocery store to a cosmetics brand headquarters, to an art gallery and now, a place where Memphians exchange vows and celebrate, 409 South Main has connections with many different Memphis people and landmarks. 409 South Main was designed and built in 1912 by architects Jones and Furbinger, who also designed the Boyce-Gregg Home (now Junior League of Memphis), Peabody Elementary, and Snowden Elementary. White Wilson Drew Wholesale Grocers were the first tenants. 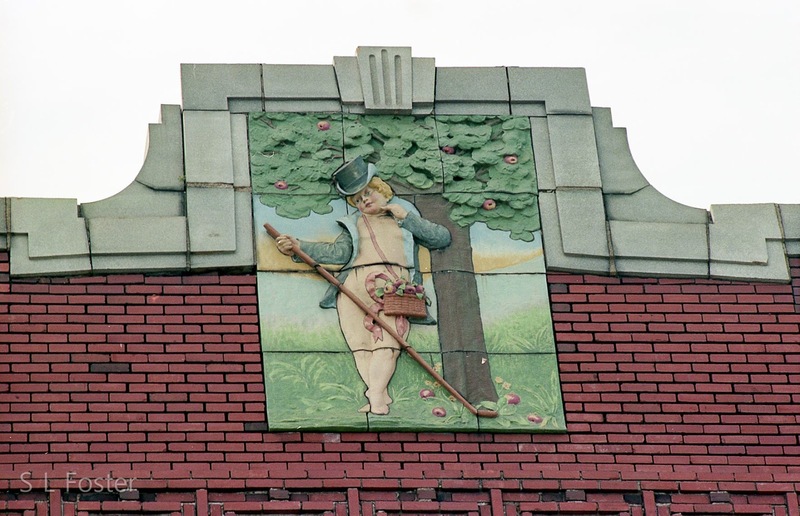 They sold Puck Brand goods and spices, hence the Puck crest at the top of the building (Puck, by the way, is the sprite from Shakespeare’s A Midsummer Night’s Dream). J.C. Felsenthal Co., another grocery company, operated out of 409 South Main in the 1920s. J.C. Felsenthal (the man) retired in 1934 and died in 1939. One of his pallbearers was Arthur Seessel, of the Seessel’s family*. Sometime in the 1930s, the building became the headquarters for Lucky Heart Cosmetics, which catered to the African-American women. Lucky Heart was like Avon and Mary Kay — they had representatives selling products to others. During the 1960s, Lucky Heart ran ads in Ebony magazine in order to recruit potential representatives. Lucky Heart also had a division called Lucky Mon-gol, which sold spiritual hoodoo products. By the 1980s, the once-bustling Main Street had declined. The Puck Building was in good shape, but other buildings were desolate—including the Lorraine Motel, which is within spitting distance of 409 South Main. Paul Shapiro, owner of Lucky Heart Cosmetics and son of one of the company’s original founders, donated $10,000 to the Lorraine Civil Rights Museum Foundation, which helped prevent the building from being sold to another bidder and possibly being demolished**. By the late 1990s, the area began to thrive again. Trolley Night began in 1998. The Jay Etkin Gallery moved in 409 South Main in 1999 and was there for ten years. The gallery was a “cornerstone of the historic arts district,” and a popular stop on Trolley night, but had begun to see a reduction in visitors during the recession in the late 2000s***. Now, the building has no permanent tenant, but is available to rent for weddings and events. So you can get married in at least two buildings designed by Jones and Furbinger— 409 South Main and the Boyce-Gregg Home. But if you choose 409 South Main, Puck will look over you, and you'll have a great mural backdrop for photos. And, by the way, Lucky Heart is still in business. **Lauterbach, Preston. “The Crucible." Memphis Magazine, April 2008. ***Blank, Christopher. “A new model—Jay Etkin Gallery’s move to Edge about survival amid slump.” The Commercial Appeal, April 24, 2009. Tamara Williamson was born and raised in Memphis. She currently works at ArtsMemphis as Community Engagement Associate, where she works to increase access to the arts in communities whose residents have little or no exposure to them. She loves Memphis, old buildings, reading, and, of course, the Grizzlies. I work with the Bartlett Historical Society. Did you know there was a museum in Bartlett and a Historical Society. Would love you to come talk to us about Memphis History or any Shelby County History. We meet the second Monday each month at 7 P.M. We have a program director, but if you are interested would love for you to come speak to us. Come visit us first if you want. Always Welcome!